So this is a great product and very popular. The boxes have a white outer layer and are brown kraft on the inside. Easy to personalise you with your brand using a high quality label for a very professional looking finish. 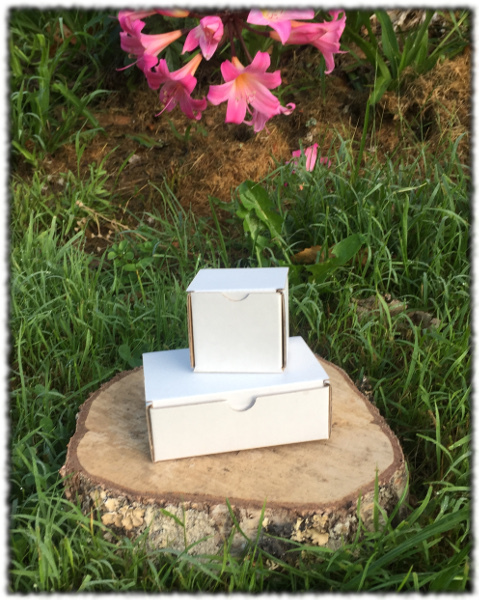 Easy to put together, they form a very solid little hinged lid box. They are "self locking" so do not require gluing or stapling and are perfect for smaller, more fragile items (jewelery, electronics, souveniers, soaps, cosmetic bottles and jars etc). These boxes are shipped flat pack to save on space and shipping cost.